In a recent study published in the internationally renowned journal Nature Biotechnology, scientists from MIT developed a new type of nanoparticle that can transport the CRISPR gene editing system and specifically target the mouse genome so the researchers are able to take advantage of the nanoparticles to carry the CRISPR component, thereby eliminating the need to use the virus for delivery. Using this new delivery technology, the researchers cut specific genes in about 80% of liver cells, perhaps achieving the best rates of success using CRISPR technology in adult animals. “What’s really exciting here is that we’ve shown you can make a nanoparticle that can be used to permanently and specifically edit the DNA in the liver of an adult animal,” says Daniel Anderson, an associate professor in MIT’s Department of Chemical Engineering and a member of MIT’s Koch Institute for Integrative Cancer Research and Institute for Medical Engineering and Science (IMES). In this study, a gene called Pcsk9, which is known to regulate cholesterol levels in the body, may be associated with a rare disease called dominant familial hypercholesterolemia in humans. At present, two antibodies drugs approved by the FDA are capable of inhibiting the expression of Pcsk9. However, these antibody drugs need to be taken regularly for the rest of the patient’s life. The new nanotechnology can permanently edit the gene and may provide a new therapeutic approach for the treatment of this rare disease and other liver disorders. 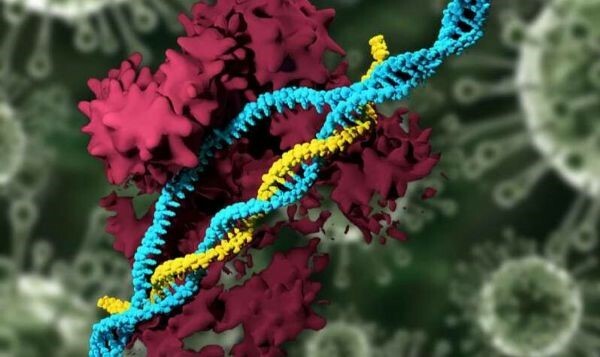 Many scientists are trying to develop a safe and effective way to transport CRISPR components needed for CRISPR, including DNA-cutting enzyme—Cas9 and a short-chain RNA which can guide enzymes into the specific sites of genome, leading Cas9 where to make its cut. In many cases, scientists rely on the virus to carry the gene for Cas9 and RNA guide strands. In 2014, Anderson and his colleagues developed a novel non-viral delivery system that uses CRISPR technology to effectively treat tyrosinemia (a liver disease). However, this technique requires high pressure injections, which can potentially damage the patient’s liver. Later, the researchers replaced the virus by packaging the messenger RNA encoding Cas9 into the nanoparticle, thereby enabling the key component of CRISPR to be delivered without high-pressure injection. With this technique, researchers were able to edit the target gene in about 6% of hepatocytes, which is enough to treat tyrosinemia. In this paper, the researchers used nanoparticles to deliver Cas9 and RNA guide chains without the need for viruses. To efficiently deliver RNAs, they first had to chemically modify RNA to protect it from the body’s enzymes. The researchers then packaged these modified RNA-directed strands (enhanced sgRNAs) into lipid nanoparticles that they previously used to deliver other types of RNA to the liver, and in the study they injected them into mice along with nanoparticles containing mRNA that encodes Cas9. They focused on the cholesterol-regulating Pcsk9 gene, and eliminated this gene in more than 80% of the liver cells, which can not be detected in these mice. The total cholesterol levels of the treated mice also show a 35% decline. The researchers are currently working on identifying if the technology can be used to treat other liver diseases. Anderson believes that a fully synthetic nanoparticle that specifically turn genes off may be a powerful tool not just for the Pcsk9 gene, but also for other diseases. He thinks the liver is an important organ of the human body and also a source of many diseases. If reprogramming of DNA in liver cells can be achieved, the researchers may be able to effectively treat various liver-derived disease. In this study, the researchers have developed new applications of nanotechnology and open up new ways for gene editing research.